Kevin Garnett discusses Turner's Area 21, his media career, why "live TV is crackin"
Kevin Garnett's post-playing NBA career is going off without a hitch. After a 21-year NBA career that included 15 All-Star appearances, an MVP award and a championship, Kevin Garnett needed an outlet for his well-renowned passion, intensity and energy that he displayed on the court. In the summer of 2016, Garnett was weighing his options, whether to retire or continue his playing career. KG ended up taking a few very preliminary meetings with Turner Sports, where they discussed what a potential partnership would look like, centered around Garnett’s “candor and unfiltered, raw nature,” according to Craig Barry, the executive vice president and chief content officer at Turner Sports. Talks continued into the early fall, and Barry and Garnett had grown so comfortable with the idea of giving KG his own unique platform that Turner execs realized that this idea of an alternative show centered around a mix of sports and pop culture would only work if Garnett agreed to retire and do the show. Garnett announced his retirement on Sept. 23, and on Oct. 27, he officially joined Turner to host Area 21, “a social-first platform with TV integrations,” per a Turner spokesman, that would have segments interspersed during TNT broadcasts and on social. In an extensive interview with Awful Announcing, Garnett spoke about his transition from his playing career to his Area 21 show and how he tries to cater his show to the way audiences are now consuming content. 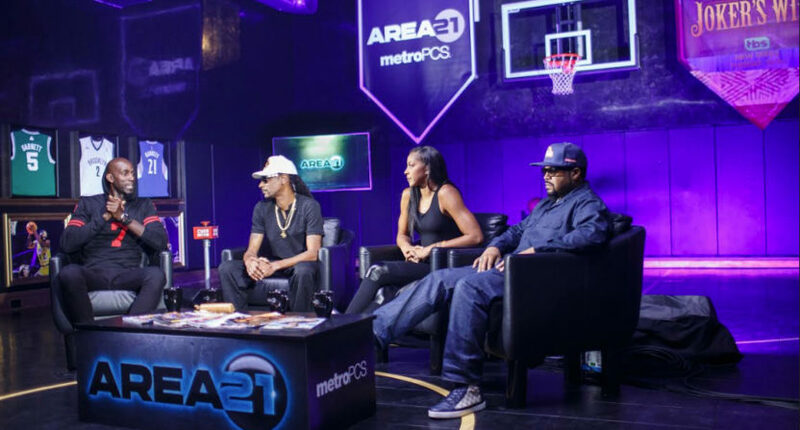 Garnett wanted Area 21 to showcase his true character and authenticity, which takes many former athletes who dive into TV careers after retirement a long time to accomplish. After a career where his relationship with the media wasn’t exactly the best, Garnett’s joining the media directly after retiring seemed like a curious decision. Garnett now lives with his family in Los Angeles, but he flies into Atlanta every Thursday for Area 21 in Turner’s studios, very close to the Inside The NBA set. KG gets in at about 5 p.m. for an 8 p.m. game and attends production meetings, where they talk about the night’s content and the goals they want to accomplish during the broadcast. At about 7, Garnett joins the rest of the ATL-based TNT team in a lounge to eat and relax before the usual doubleheader begins. Then Inside The NBA begins, with either live or taped Area 21 segments mixed in on TNT during the telecasts and quickly uploaded onto numerous social platforms. Garnett sometimes is brought into a live broadcast himself for thoughts, including during a recent Celtics game. Garnett wraps up at 1 or 2 in the morning, gets a few hours of rest and takes a morning flight out of Atlanta. Garnett said he usually books his guests two to three weeks in advance, and likes to have an eclectic mix of sports and pop culture figures join the show. On Thursday, KG will be joined by rapper Big Boi and former NBA players Rasheed Wallace, Rod Strickland, and Tony Delk. Wallace has been among Garnett’s favorite recurring guests, he said, along with former teammates Paul Pierce and Sam Cassell. Garnett’s favorite segments over the year and a quarter of Area 21 includes a freestyle rap he had with Shaq and former BET host Big Tigger, a conversation with “Fondue, White Chocolate” Jason Williams, and a trip to Los Angeles to hang out with Snoop Dogg, Ice Cube and Candace Parker. Garnett’s ability to work with so many different and diverse guests makes him a chameleon of sorts, Barry said. “Depending on the kinds of triggers that are around him, like the subject matter in the space and the guests that he has, he’s really comfortable going in a lot of different directions,” Barry said. It did take Garnett some time to get comfortable in front of the camera, about five or six shows before he started getting into a rhythm and knew what to expect, without having too much anxiety going into the broadcasts. Garnett said he’s a big fan of the WNBA and tries to promote female athletes on Area 21 when he can. He’s also had segments about Colin Kaepernick, diversity, and other subjects that would be considered taboo on other networks. But the most famous Area 21 show was when he was joined by his former Boston Celtics teammates Pierce, Rajon Rondo, Glen Davis, Kendrick Perkins, and head coach Doc Rivers. So far, it seems like Turner is quite pleased with Area 21’s success, with 10 million social video views and more than 80 million impressions last season, per Turner data. “It’s all attributed to Kevin and his ability to connect with people,” Barry said. Garnett said he’s fully embraced the social, second screen aspect and believes that’s where the future of content is. Garnett said that people are more attracted to real and live experiences now, and that his content is geared towards those more intimate experiences. “Live TV is crackin’ right now,” he said. Garnett said he’s enjoying doing Area 21, but doesn’t know what his future holds. He’s pursuing various business ventures and said he’d love to go into ownership or management at some point, including with the Minnesota Timberwolves, where he spent the majority of his Hall Of Fame career, with one caveat: He wouldn’t want to do it with the current ownership group. Garnett said that he feels differently about different things every day, so it’s hard to tell how long his broadcasting career will last. And based on the success the show seems to be having, Turner will seemingly let Area 21 go on for as long as KG is willing to bring his unique personality and expertise to the NBA on TNT. For the future, it’s ultimately up to Garnett to decide how he’ll channel the energy and intensity that made him one of the best basketball players of this generation.